On March 14th, Velasquez’s documentary A Brave Heart: The Lizzie Velasquez Story will premiere at SXSW in Austin, TX. Women Rising’s Sara Hirsh Bordo directed both the TEDx video and the official film of Velasquez’s journey, thanks to a successful Kickstarter campaign. 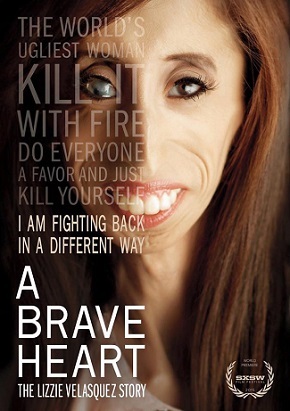 A Brave Heart: The Lizzie Velasquez Story–Official TrailerBordo’s film not only chronicles Velasquez’s life growing up with enormous challenges, but it also follows her mission to fight for the Safe Schools Improvement Act on Capitol Hill. The first federal anti-bullying bill, she hopes, would keep track of the kids being bullied in schools, and ultimately, prevent bullying in the future. As she prepares for her first film premiere, Velasquez took time out to answer my questions on making the documentary, creating change and taking the high road. EYE: How does it feel to be the inspiration for the Life is Beautiful festival in Las Vegas? LIZZIE: The fact that I was the inspiration for Life is Beautiful is extremely humbling. I think it goes to show that when one person is trying to make a change, it can lead to something bigger than themselves. EYE: What change or impact do you hope to inspire with your documentary A Brave Heart: The Lizzie Velasquez Story and the Safe Schools Improvement Act? LIZZIE: I hope that the film’s impact will help to kickstart a change. My hope is that when people finish watching the documentary that they are inspired to get on board with us and really rally around the Safe Schools Improvement Act. Our voices need to be heard together. EYE: Was producing and starring in this film the most difficult thing you have done since becoming an advocate for victims of bullying? LIZZIE: Since being an advocate for victims of bullying, the hardest thing for me was the magnitude of walking into Capitol Hill for the first time. It was one of the most intimidating things I’ve ever done. As soon as I sat down for our first meeting, my protective instincts kicked in and it went from being intimidating to being very empowering. EYE: How do you like the titles “hero” and “anti-bullying activist?” Is that a big responsibility for you? LIZZIE: I look at those two titles as being such an honor and privilege. Absolutely, they both come with a lot of responsibility, but knowing that my responsibility is to be the voice for others who might not be able to use theirs makes me want to move mountains! EYE: You are using the hashtag #highroad. Do you think something as simple as “taking the high road” can and will end bullying in your lifetime? LIZZIE: I will be the first to tell you that, unfortunately, bullying will never end. At the same time, I will be the first to tell you that taking the high road can and will lead to change. Overtime, I know if we consciously start taking steps like taking the high road and not bullying the bully back, we will eventually see a difference in the amount of bullying happening in our lifetime. EYE: Thank you, Lizzie, for your courage and much success to you at SXSW!